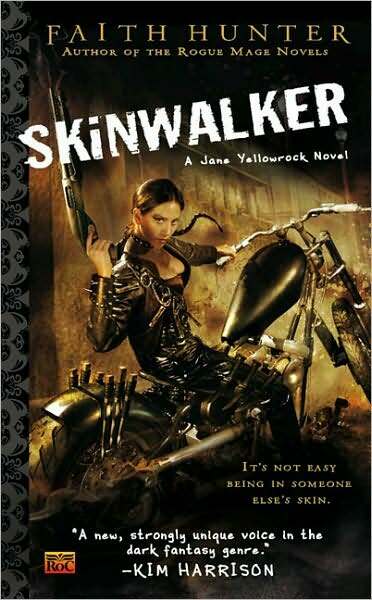 Jane Yellowrock,(Dalonige i Digadoli), a Cherokee Skinwalker whose legal, but completely false, birth certificate puts her at age 29, is a vampire hunter. Her past is beyond reach, as she woke up wondering in the woods, naked, scarred and without memory of the English language. Before that she remembers bits and pieces of her father & grandmother, and her change into “Beast”, a part that is still with her. She believes she is over 100 years old, and her shape shifting and years living as “Beast”, a mountain lion, have kept her physical human age young. Her shape shifting gives her abilities far beyond a normal human. She can scent and track, has better than normal vision and hearing and can move more than humanly quick – almost vamp quick. She can shift into almost any animal, although big cats are her favorite. She’s still not sure how she and Beast have come to their current duality, but they work together well in her line of work. She is contracted by an old vamp named Katherine Fontaneau, of Kaitie’s Ladies) to come to New Orleans and track and kill a rogue vamp that is killing indiscriminately between humans and other vamps. Beast names this rogue “Liver Eater”, and with Beast’s help and at times, Beast’s form, Jane is able to track and kill the “Liver Eater”, who she finds is also a shape shifter and she believes, a Cherokee. Faith Hunter writes this series with a believable knowledge of vamps, their blood servants and hierarchy, and enough knowledge of “The People” and their practices and beliefs to make it a very interesting read. Jane is precocious and aggressive, and her mouth gets her into as much trouble as her chosen line of work. Laugh out loud funny in parts, hard to put down all the way through.